Last week, from August 12th to the 16th, the children of Onna-son and surroundings had the chance to have an army of scientists from OIST teaching them about SCIENCE! This annual event, called the School of Science, became in spite of its young age an expected tradition for the local kids. Therefore the Biodiversity and Biocomplexity unit had to be present! On Monday and Tuesday, 27 kids aged from 7 to 9 years old had the opportunity to learn more about arthropods living in Okinawa. 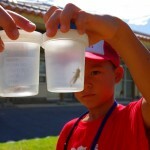 During these two days, kids learned about the incredible diversity and importance of insects in terrestrial ecosystems. A brief lecture was proposed to them, quickly followed by field work! There, the young entomologists collected several species of spiders, ants, grasshoppers (quite diverse around the classroom), butterflies, ladybeetle, Hemipterans, and even a praying mantis!